The real sticking point with using Arduinos in Internet applications like this is finding a bridge between the lowly 8-bit microcontroller and the web. 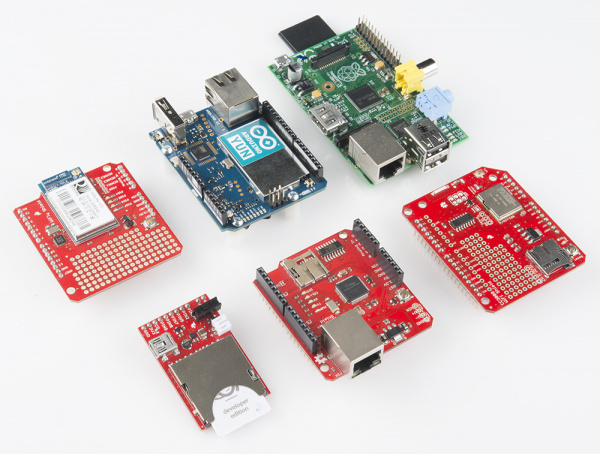 WiFi or Ethernet-enabling shields or breakout boards are usually the best option for that. If you don't mind being tied down by wires, Ethernet can be the faster, more reliable option of the two. 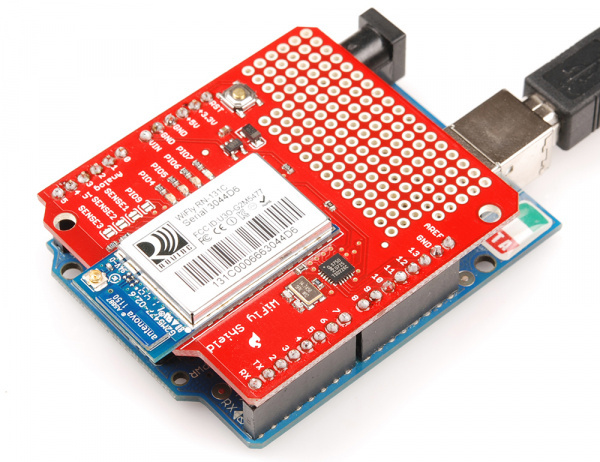 The Ethernet Shield, and its variations like the PoEthernet Shield, equip your Arduino with all it needs to access a network and post data to a server over Ethernet. We'll use this circuit for all four of the Arduino examples. A simple selection of digital and analog sensors are used to demonstrate the abilities of the Data.SparkFun.com service. The output of a photocell (voltage divided with a 10kΩ resistor) connects to A0. A momentary push-button is connected to D3 on one end and ground on the other. And a SPDT switch can connect D5 to ground or let it float. Here's an example sketch that posts data to Data.SparkFun.com using the Ethernet Shield. Copy and paste from below or click here to download the sketch. an Arduino and an Ethernet Shield. will be initiated whenever pin 3 is connected to ground. if you're planning on having DCHP fill your IP in for you. The static IP is only used as a fallback, if DHCP doesn't work. 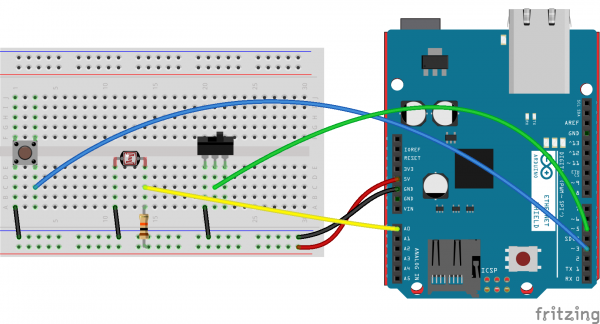 to form a voltage divider output to the Arduino). * D5 - SPDT switch to select either 5V or 0V to this pin. * A CC3000 Shield sitting comfortable on top of your Arduino. example in the Ethernet library. // If the trigger pin (3) goes low, send the data. No library additions are required, since the Ethernet library used here is included with Arduino. Unmodified, this example sketch should post to our example stream whenever you press the button connected to D3. The mac array -- a list of six HEX bytes -- can be changed to any value you require. Newer Ethernet shields may even have MAC address printed on them. Just make sure your MAC address is unique! 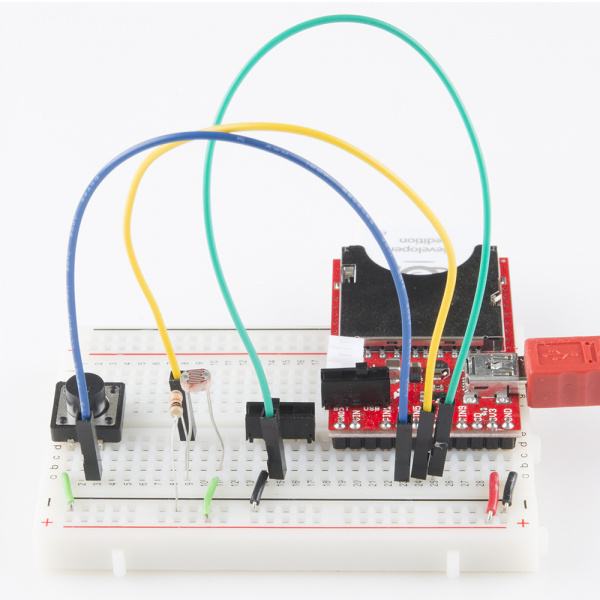 Unless your using something else, leave the server variable set to "data.sparkfun.com". Customize your IP address to match compatible values on your network -- this only becomes necessary if DHCP fails; the static IP is a fallback plan. The publicKey and privateKey variables will be given to you when you create your stream. You can also adjust the number of data fields and their names here as well. 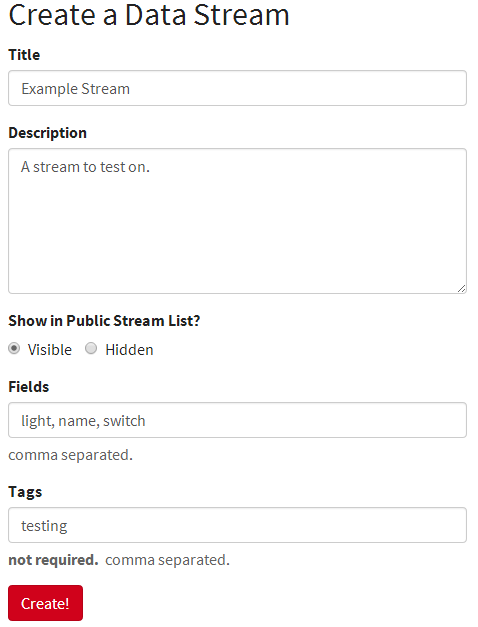 The values in the fieldNames string array should match exactly what you typed when you created the stream. After you've fixed the WiFi and datastream settings, upload the sketch. Then open the Serial Monitor and set the baud rate to 115200 bps. Some debug messages will flow by at the start. Once you see your IP address printed, your Arduino is connected and you're ready to post some data. One of the fields in this example pushes a name to the server. If you want to update the name value, type in your name into the Serial Monitor and terminate it with a '!'. To push your data to the server, simply press the button tied to D3 (or just short that pin to ground). A few serial lines will quickly be printed. Check to make sure HTTP/1.1 200 OK is somewhere among those lines -- that means the server accepted your request. To further customize the sketch, you'll want to mess around with the "gathering data" stage. In this example, a trio of lines load data into the fieldData array, converting each into a string beforehand. Those values from fieldData are later used in the postData() function when the HTTP GET string is formulated. Most of the importatnt stuff happens in the postData() function. Here you'll find an example for creating an HTTP GET, and routing it out to the server. Check out the comments for a line-by-line dissection of the code. The CC3000 WiFi Shield (or, alternatively, the CC3000 Breakout) is a relatively low-cost WiFi solution for the Arduino. This is a fully-functional wireless networking shield which gives any Arduino-compatible board an easy route to WiFi and the Internet. If you haven't already, check out the CC3000 Hookup Guide, which will show you how to install the shield and get started using the library. We'll use the same, exact circuit as that in the Arduino & Ethernet Shield example. 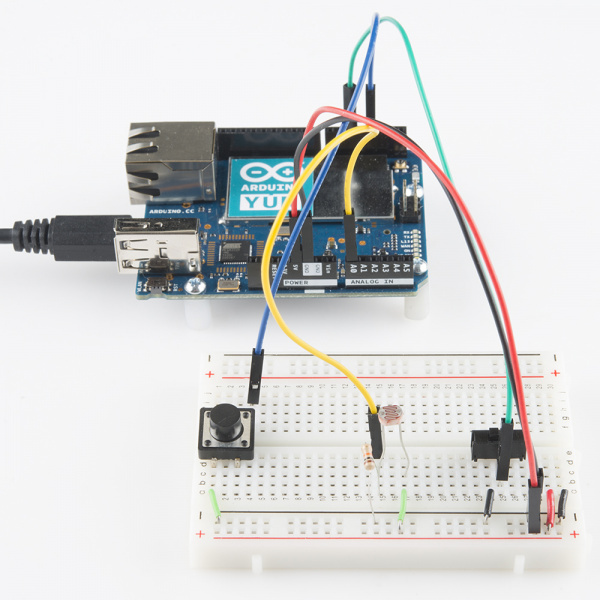 Before running the sketch, you'll need to download and install the CC3000 Arduino Library. 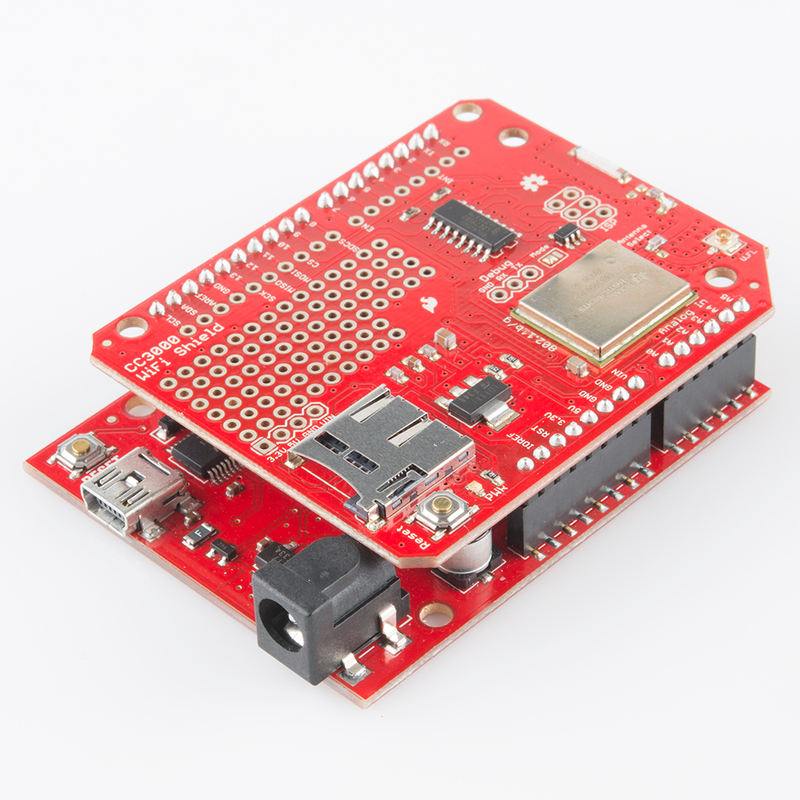 You can grab it from our [GitHub Repository]((https://github.com/sparkfun/SFE_CC3000_Library) or download it directly by clicking here. Check out our CC3000 Library Installation Guide for help installing the library. an Arduino and the CC3000 Shield. setting using three variables available. * D5 - SPST switch to select either 5V or 0V to this pin. example in the SFE_CC3000 library. // for using the CC300 shield as a client device. // Progmem allows us to store big strings in flash using F(). // We'll sacrifice some flash for extra DRAM space. // Don't change these unless you're using a breakout board. // Error: 0 - Something went wrong during CC3000 init! The ap_ssid and ap_password strings should be adjusted to match your WiFi network. If your network is open (no passkey), that second variable should be blank (ap_password = "";). Also make sure to adjust the ap_security variable to match the security of your network. See the comments for possible values. With those correctly set, you can run the sketch. This example sketch should post to our example stream whenever you press the button connected to D3. The WiFly Shield is another easy solution for wirelessly connecting your Arduino to the Internet. Check out our WiFly Shield Hookup Guide, if you haven't already, for help setting up and testing out your WiFly Shield. We'll use the same, exact circuit as that in the previous Arduino examples. This example sketch requires the WiFly Shield library. You can download it from the GitHub repository. Follow the instructions in our How to Install an Arduino Library for help installing the library. an Arduino and the WiFly Shield. * A WiFly Shield sitting comfortable on top of your Arduino. The ssid and passphrase character arrays should be adjusted to match your WiFi network. If your network is open (no passkey), that second variable should be blank (passphrase = "";). Also make sure to adjust the wpaEnabled variable to match the security of your network. If it uses WPA, set that variable to true, otherwise (if it's open) set it to false. With its built-in WiFi and Ethernet, the Arduino Yun was made for internet-of-things applications like this. 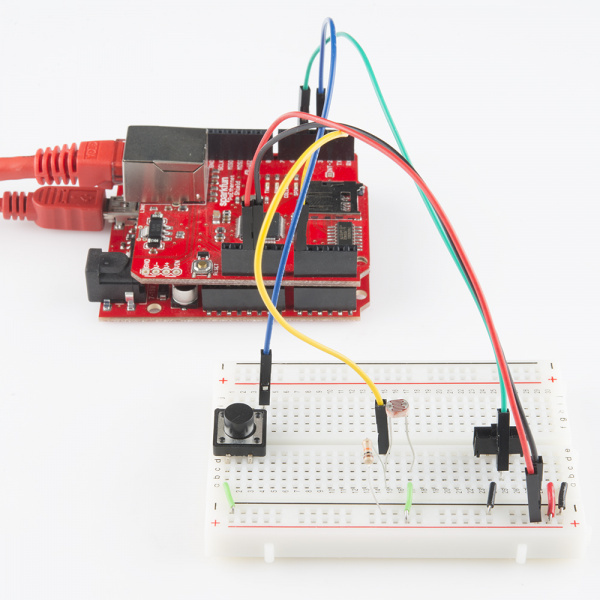 For help getting started with the Yun, check out Arduino's Guide to the Arduino Yun. If you're going to use the Yun over WiFi, definitely check out their section on configuring the WiFi. As with every other Arduino example in this tutorial, we'll be using a simple circuit consisting of a photocell (voltage divided with a 10kΩ resistor) connecte to A0. A momentary push-button is connected to D3 on one end and ground on the other. And a SPDT switch can connect D5 to ground or let it float. 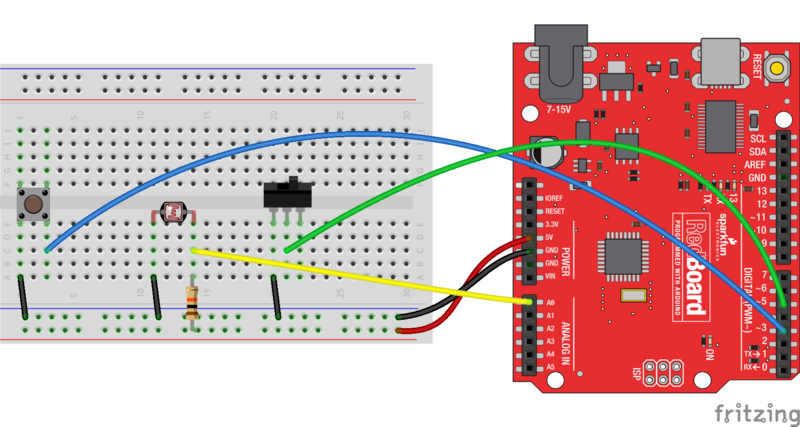 Pretend the RedBoard in the Fritzing diagram above is Arduino-blue, and you should be golden. Make sure your Yun is connected to the Internet, before continuing on. If you have an Ethernet switch or router nearby, simply connect an Ethernet cable between the two. If you're using your Yun through WiFi, follow these directions to connect your Yun to a WiFi network. Here's the code. Copy and paste from below, or click here to download it. keys before uploading! These are in the global variable section. * Your Yun should also, somehow, be connected to the Internet. You can use Ethernet, or the on-board WiFi module. // used to construct Shell commands and read the response. // How many data fields are in your stream? // What are the names of your fields? // Should look like: --data "fieldName=fieldData"
curlCmd += "--header "; // Put our private key in the header. curlCmd += "\" "; // Enclose the entire header with quotes. After uploading the sketch, open the Serial Monitor and set your baud rate to 115200 bps. Wait for the "Ready to Stream" message to appear, then press the button to send data. This example sketch should post to our example stream by default. You can update the name value that posts, by sending a series of characters followed by an exclamation mark (!). The section in the code under "Phant Stuff" is where you can alter variables and set the Yun to use a data stream of your own. The publicKey and privateKey variables should be set to the respective keys your were supplied when creating your stream. Also make sure to set the NUM_FIELDS variable to the number of fields in your stream and update the fieldName array values accordingly. 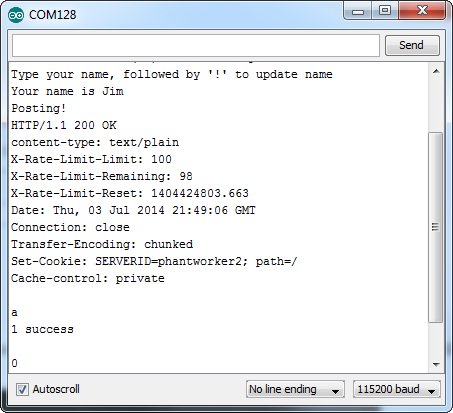 In this example we use the Unix cURL command to transfer data to a server. The Yun's Process class comes in handy for sending a shell command, and reading its response. Most of the action happens in the void postData() function. That's where we read the Arduino's inputs and formulate a cURL command. The contents of the cURL command include the server URL, public and private keys, and our data keys and values. Check out the comments in that function for a line-by-line dissection. 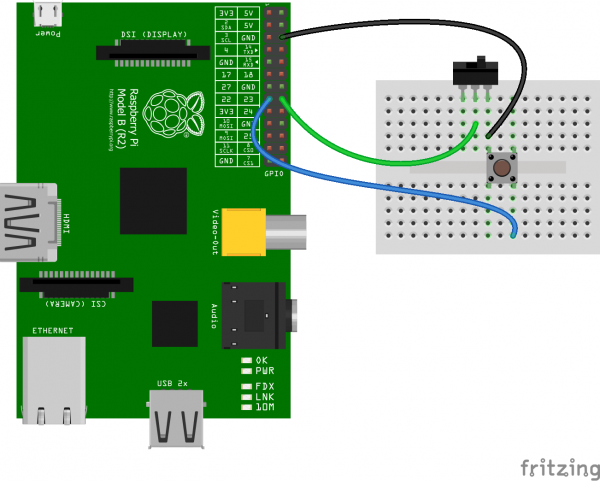 The multi-talented Raspberry Pi has no shortage of tools for posting data to web servers. You could use a shell script and cURL, similar to what we did on the Yun, but in this example we'll use Python, which pairs nicely with the Pi's RPi.GPIO module. If you haven't used Python on the Pi to read-and-write to I/O pins, check out our Raspberry gPIo tutorial. This tutorial leans on that to read the status of a couple input pins. The button is connected to the Pi's pin 22 (that's the Broadcom chip pin), and the switch output is connected to pin 23. If you have a Pi Wedge, it makes the job of wiring to the Pi much easier. Right-click and Save Link As to download the example python script, or copy and paste from below. 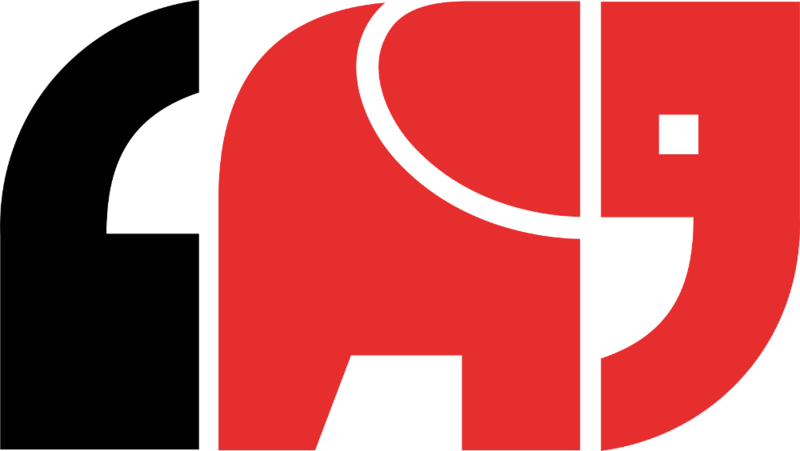 We've named our file phant-raspi.py, if you're making the file on your own. Place it in an easily-accesible directory on your Pi. # This example demonstrates how to post data to a phant server (e.g. 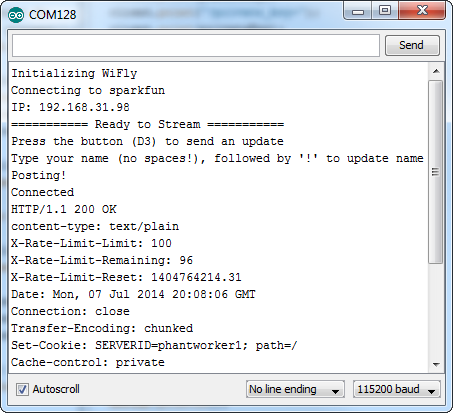 #   data.sparkfun.com) using python on a Raspberry Pi. 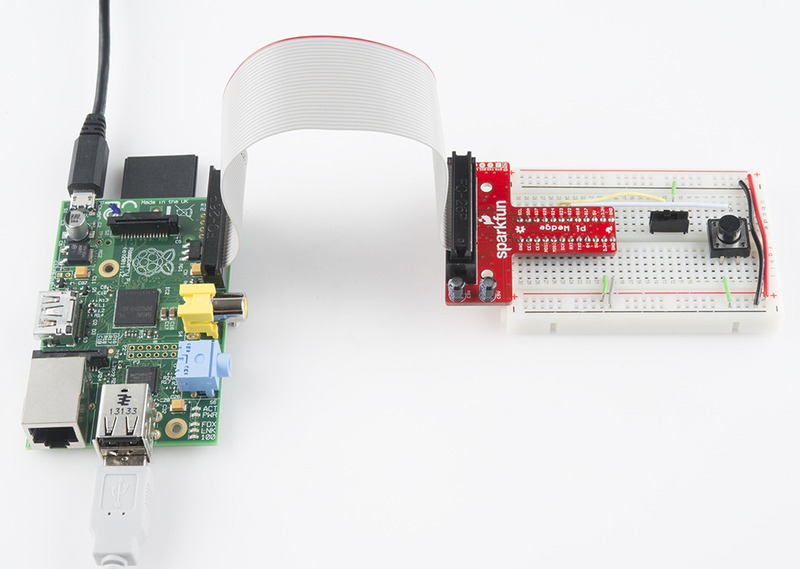 #   The RPi.GPIO module is used to enable I/O reading and writing. #   private keys (publicKey and privateKey vars). # at the local, and you've found our code helpful, please buy us a round! # Distributed as-is; no warranty is given. # so we need to check if it's 0. With the script running, when you connect the button pin (22) to ground it should send an update. A handful of messages will appear each time a message is sent. You want to see "200 OK" after the "Sending an Update!" message. That should indicate that the HTTP POST was succesfully sent. You may also want to modify how the data for those fields is gathered. That happens near the very beginning of the lone if statement. Field 0 ("light") contains the current time/date, field 1 ("switch") contains the status of our switch, and field 2 ("name") contains the localhost name of your Pi. The Electric Imp -- a development platform centered around Internet-of-Things applications -- is a perfect tool for sending data to a Phant stream. If you want to get code on the little SD-card sized module, it already has to be Internet connected. Plus the Imp API already has all of the HTTP-related features you need to send server requests. If you're unfamiliar with the Electric Imp, check out our Electric Imp Hookup Guide, which will guide you through the BlinkUp process and includes a few example programs to get you started. The output of a photocell (voltage divided with a 10kΩ resistor) connects to pin 5. A momentary push-button is connected to pin 2 on one end and ground on the other. And a SPDT switch can connect pin 7 to ground or let it float. As with most Electric Imp code examples, there are two halves to this puzzle: device code and agent code. Create a new model in your imp IDE -- we called ours "Phant Imp" -- and paste these two bits of code into their respective half. * Pin 5 - SPST switch to select either 5V or 0V to this pin. server.log("Phant Imp has started"); // Hello, world. The very first few lines of that code, under the "Phant Stuff" heading, determine the field names of your data steram. Make sure to set the FIELD_COUNT variable to the number of data fields in your stream, and stick the exact name of each field in the fieldNames array. Paste this code into the left, agent half of your Imp IDE. // dataString string to construct a HTTP POST, and send it to the server. // Construct the headers: e.g. "Phant-Priave-Key: PRIVATE_KEY"
// Send the POST to phantURL, with phantHeaders, and dataString data. The agent is responsible for receiving data from the Imp and sending it off to a server in the form of an HTTP POST. The public and private keys of your stream are stored in this half of the model. Update those, under the "Phant Stuff" heading, to the hashes in your stream. In this example, the agent is totally ignorant of the data being passed to the stream. It's relying on the device to construct that string exactly as the server wants to see it. That seemed to be the easiest way to handle this, as the device can only send a single string at a time to the agent. With those two halves of code copied and pasted, upload them to your Imp. Then, whenever you press the button, it should post its data to our example stream. 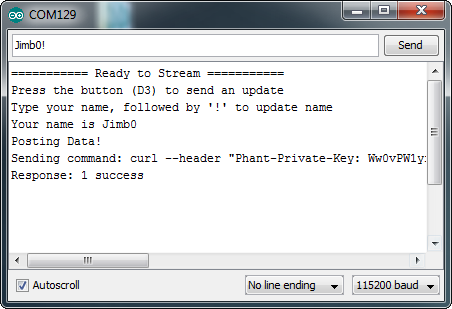 Update the variables under the "Phant Stuff" headings to configure it to your stream. Phant Documentation Page -- All of the in's and out's of Phant. This page shows how you can post to the server, read from the server, and even delete your stream. Phant GitHub Repository -- Want to use Phant on your server? Want to modify the code? It's all hosted here on GitHub. Phant Example Code -- Example code covering perl, PHP, Ruby, and shell. Phant Arduino Library -- The Phant Arduino library makes creating HTTP GETs and POSTs super easy. 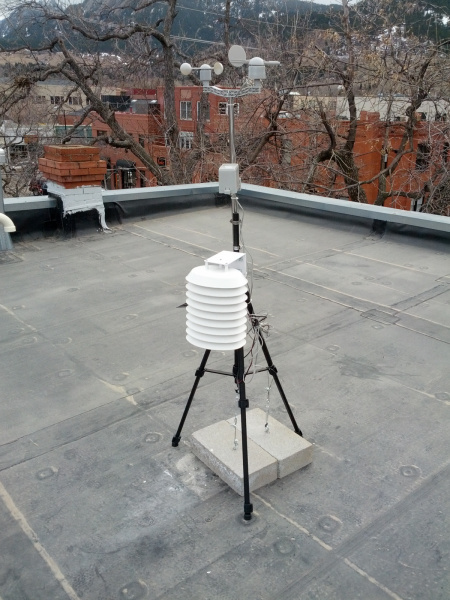 Weather Station Wirelessly Connected to Wunderground -- This weather station project served as the main inspiration behind Phant. Check this tutorial out for more Electric Imp goodness. Internet Datalogging with Arduino & XBee WiFi -- This tutorial explains how to combine an Arduino, XBee WiFi module, and XBee Shield in order to post data to Phant. Browse through our sensor category, pick a few out, and log them!